The committee advanced a bill that would adjust the state’s school funding formula to match budget projections. 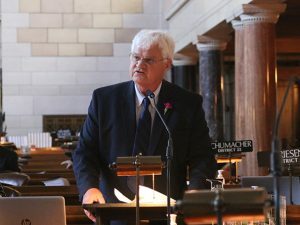 LB409, introduced by Sen. Mike Groene of North Platte and passed 43-0, modifies two components of the formula the state uses to distribute money to school districts. It reduces the base limitation rate — the rate at which school budgets are allowed to grow from year to year — for school fiscal year 2017-18 and FY2018-19 from 2.5 percent to 1.5 percent. It also increases the local effort rate, which accounts for a district’s property tax capacity, from $1.00 to approximately $1.02. Under the bill, net option funding is calculated by multiplying the net number of option students by 95.5 percent of the statewide average basic funding per student for those years. The bill also includes community achievement plan aid for schools in the Omaha learning community, which lost funding after its common levy was eliminated. The committee also advanced a bill that delays the deadline for certifying state aid, budget authority and applicable allowable reserve percentages for state aid to schools. Under LB119, also sponsored by Groene, the deadline is delayed from March 1 to June 1 for 2017 only. Senators voted 45-0 to pass the bill. LB214, introduced by Sen. Steve Halloran of Hastings, would end the master teacher program, which assists teachers seeking a National Board for Professional Teaching Standards credential. Teachers who apply for the program are eligible to receive an award amounting to 50 percent of the registration fees. They may apply to be reimbursed for the other half of the fees after completing the program. After fees are reimbursed, the remainder of the program’s funding is used to pay a $5,000 salary bonus to teachers who have the credential. Funding for the program in FY2016-17 was then eliminated by LB22, an Appropriations Committee bill that made cuts to the budget early in the session. Funds remaining from FY2015-16 will be distributed for registration awards and salary bonuses. The committee advanced a bill that requires schools to adopt a policy to accommodate pregnant and parenting students. Current law allows a mother to breast-feed her child in any public or private location where she otherwise is authorized to be. Introduced by Sen. Tony Vargas of Omaha, LB427 expands that provision to include mothers who attend public, private, denominational or parochial day schools. The bill requires those schools to provide private or appropriate facilities or accommodation for milk expression and storage for their students. The bill includes provisions of LB428, also sponsored by Vargas, that require school districts to adopt a written policy providing standards and guidelines to accommodate absences related to pregnancy and child care for pregnant and parenting students by May 1, 2018. School policies are required to include the minimum standards contained in a model policy developed by the state Department of Education. At a minimum, the policy must provide for student absences due to pregnancy and allow students to return to school and participate in extracurricular activities after pregnancy. It also must provide alternative methods for keeping pregnant or parenting students in the classroom by allowing them to complete coursework at home or by providing online classes or visits from tutors. The model policy must identify private, hygienic spaces where students could express breast milk during the school day. Finally, if schools do not have an in-school child care facility, the policy must establish a procedure for assisting student parents by identifying local child care providers. A bill that provides a technical definition for dyslexia, which causes difficulty in acquiring and processing language, also was advanced by the committee this session. Dyslexia had been included as a specific learning disability in state law but was not defined. LB645, introduced by Pansing Brooks, defines dyslexia, in part, as a learning disability with a neurobiological origin that is characterized by difficulty with accurate or fluent word recognition and by poor spelling and decoding abilities. LB62, introduced by Norfolk Sen. Jim Scheer and passed 39-5, repeals a law prohibiting public school teachers from wearing religious garments at school. School boards were required to suspend for one year any teacher in violation of the laws while termination of employment was required after a second violation. The committee considered a bill that would require third-grade students who struggle with reading to repeat the grade and receive extra instruction. Elkhorn Sen. Lou Ann Linehan, the bill’s sponsor, filed a motion to place LB651 on general file, even though the committee had taken no action to advance it. This unusual maneuver requires a majority vote of the Legislature. Senators voted to adopt the motion 30-13. LB651 would require school districts to offer an accelerated reading intervention program to students in kindergarten through third grade who are identified as having a reading deficiency based on local or statewide assessments. Under the bill, a student with a reading deficiency would receive an individual reading improvement plan developed by the teacher, principal, other school staff and the student’s parents. Beginning with school year 2019-20, if the student scores below grade level on the third-grade statewide reading assessment, the student would be retained in third grade unless he or she qualifies for an exemption. Additionally, schools would be required to provide summer reading camps offering at least 70 hours of instruction to students scoring below grade level on the third-grade statewide reading assessment. A bill that would authorize teachers to restrain violent students and remove unruly students from the classroom without facing legal action also remained on general file. Introduced by Groene, LB595 would allow teachers and administrators to use physical force or restraint to subdue a student who becomes violent toward himself or herself, another student, a teacher or an administrator. A teacher or administrator also could restrain a student who is destroying school property. The proposal also would allow a teacher to remove a student from class if the student’s behavior has repeatedly interfered with the teacher’s ability to communicate with students or with other students’ ability to learn. A student removed from a classroom for disruptive behavior could be placed into another classroom, in-school suspension or an alternative education program, but a principal could not return the student to the classroom from which he or she was removed without the teacher’s consent. As introduced by the committee, LB512 was drafted to make several technical changes to education law. As amended, it includes the provisions of several other education-related bills. LB457, introduced by Sen. Tom Briese of Albion, restricts a budget and levy limitation exemption for the funds a school district agrees to pay teachers and administrators in exchange for voluntary termination of employment. As amended, it exempts from budget and levy limits the amounts levied to pay for 75 percent of the funds used for voluntary termination agreements for fiscal year 2018-19. That would decrease to 50 percent for FY2019-20 and 25 percent for FY2020-21. The bill also allows school districts already at their maximum levy to exempt from budget and levy limitations up to $35,000 of payments for a teacher’s voluntary termination agreement that is not part of a collective bargaining agreement. Provisions of LB123, introduced by Pansing Brooks, authorize the Coordinating Commission on Postsecondary Education to assess a fee on for-profit post-secondary institutions in the state and direct the proceeds to a cash fund. The commission then may receive, evaluate and pay claims to students to recover lost tuition and fees resulting from the closure of a for-profit institution. LB175, introduced by Sen. Adam Morfeld of Lincoln, prohibits technology companies that contract with schools from using student data for targeted advertising or creating student profiles for non-educational purposes. LB235, introduced by Sen. Lynne Walz of Fremont, authorizes recipients of a grant under the Summer Food Service Program to spend a grant’s full amount when starting or expanding a summer food program. As amended, the bill reduces the amount of money appropriated to the program from $140,000 to $100,000 per year. LB398, introduced by Omaha Sen. Justin Wayne, requires that someone currently certified in first aid, CPR and drowning risk prevention be present at every swimming pool owned, rented, leased or otherwise used by a school district for practice, competition or other school function. A bill that would authorize charter schools and two others that would increase state financial aid to students who attend private schools remained in committee. LB630, introduced by Sen. Tyson Larson of O’Neill, would create an eight-member commission to grant and oversee charter school compacts. The bill also would authorize school districts to grant and administer compacts for those schools to operate within their boundaries. The commission could grant compacts for charter schools to operate within a school district that has at least one school performing at the lowest level established by the State Board of Education. The schools, which would be open to all students through a lottery system, would be independent of any school board and managed by a board of trustees. Each charter school would receive state aid equal to the number of enrolled students multiplied by the statewide average basic funding per formula student. Under LB608, sponsored by Linehan and held in committee, a student who resides in the attendance area of a public school with the lowest performance level established by the state Department of Education would qualify for a scholarship to enroll in a private school beginning with the 2018-19 school year. For each student who participates in the program, school districts would be required to pay private schools either 75 percent of the expected revenue per student or the cost of tuition, books and uniforms, whichever is less. Once enrolled, the student may attend the school until graduation from high school or until he or she reaches the age of 21. Each participating student would be counted in the enrollment figures for his or her resident school district when calculating aid under the state’s school aid formula. A student’s resident district would be responsible for transporting the student to the private school. Introduced by Walz, LB490 would create a need-based grant program for eligible students who attend privately controlled, nonprofit postsecondary institutions in the state. Nebraska residents enrolled as full-time or part-time undergraduates at eligible institutions could receive the grants. Nebraska’s Coordinating Commission for Postsecondary Education would administer the program in conjunction with eligible institutions. The commission would determine criteria for the eligibility of award recipients and for setting the minimum and maximum size of the awards. It also would allocate the grants to the schools, which would distribute them to students.